Indian family businesses are increasingly seeking mentors from outside to give the next generation a rounded experience. "I have a bright CEO but he is spoiling my organisational culture. What should I do?" "My father is very dominating and tends to blindly rely on some executives. How do I make him see my point of view?" "How should I approach negotiations?" "How do I manage independent directors?" "Should I go to Davos at all? Will it help me? How do I network?" These are some questions that family-led business leaders in India, mostly from the next generation, are grappling with and seeking answers to from their mentors. 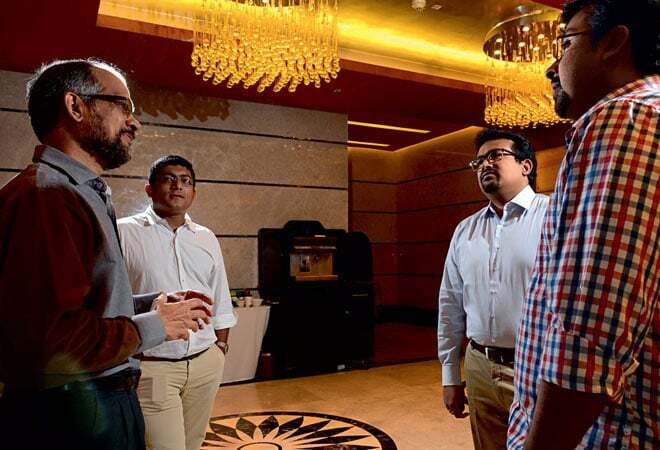 "Increasingly, and especially over the last three to five years, Indian family business leaders are seeking outside mentors as they are becoming aware of the challenges ahead. Be it those relating to communication, consensus, ownership, transfer of ownership, retirement, succession or even building leadership," says Kavil Ramachandran, Executive Director, Thomas Schmidheiny Centre for Family Enterprise at the Indian School of Business (ISB), who is usually mentoring half-a-dozen such business honchos at any point in time. Indeed, it's a perceptible trend now and there have been clear triggers for this development over the last three to five years. First, many of the Indian family-led businesses are entering a phase where the next generation is taking over the reins of the business. Some prominent examples include the Future Group, Wipro, Adani Group, Videocon Industries, TVS Motor Company, VIP Industries, Datamatics and Piramal Enterprises. Second, increasingly Indian business families are nuclear families. This means the absence of the joint family patriarch who the next generation traditionally turned to for guidance. Third, the past 10 years have seen the coaching industry in India take formal shape. There is an awareness of the need for executive coaching, especially for business leaders in new roles. There is a realisation that mentoring is crucial, more so at the time of succession. Also, it is now being recognised that growing competition makes it necessary to understand how other businesses are faring and to draw analogies and lessons from them with the help of a mentor from outside. It is lonely at the top and an unbiased guide is a good support for business leaders, feels Rahul L. Kanodia, Vice Chairman and CEO of the $150 million Datamatics Group. And help is being sought to address different concerns. "The questions before a typical mentee today have less to do with subject knowledge and content in terms of how to grow the business, etc., but are more about style, collaboration, teamwork and relationships," says Prasad Kumar (known in the Indian family business circles as P.M. Kumar), Business Chairman, Institution Building and Governance at the Bangalore-based GMR Group. Kumar mentors half-a-dozen leaders across multiple family businesses. "Mentoring is an end-to-end involvement that is focused on the world view transformation of the individual and his or her consciousness," he says. Prasad spoke to Business Today in his personal capacity. In March last year, he was instrumental in starting a first-of-its-kind, not-for-profit Parampara Family Business Institute under the GMR Group. Its aim is to aid the development of family businesses. Succession in a family business often results in a change in business strategy. "There is a growing realisation that succession is not an event and could also mean succession in strategy," says Kumar. But then, why turn to external mentors and not the patriarch, usually the father, the man who has seen the ups and downs and followed a discovery-led business journey? There is the obvious desire to be open to new ideas. Also, it may not be easy for a father to suddenly transform into a mentor. "There are some limitations as this is a personal relationship where the two need not necessarily be open to each other in all aspects," says B.V.R. Mohan Reddy, founder and Executive Chairman of Cyient, the Rs 2,000-crore IT company from Hyderabad. Reddy's son Krishna Bodanapu, the company's MD and CEO, has been consulting a mentor for the last three years. The arrangement is working well, says Reddy. M.M. Murugappan, Vice Chairman of the Murugappa Corporate Board, and an independent director at Cyient, "oversees Krishna". But Krishna is "mentored" by Ravi Bhoothalingam, former president of the Oberoi Group, who also happens to be on the board of drug maker Dr Reddy's Labs. Others agree with Reddy's views. "I can guide people based on my experience in growing the business and people management but mentoring is not my core competency, which is why I may not know the best tools and techniques that will ensure best results," says Reji K.Joseph, Director of the Rs 1,600-crore Paragon Group, a leading footwear company from Kerala with an all-India presence. He has been the internal mentor for all the next-generation members of the family of nine cousins jointly leading the business. Incidentally, even in the next generation, there are nine members. A family constitution is being drafted. The Paragon family has been in touch with Ramachandran for the last four years. "It makes a lot of difference when Ram (as Joseph refers to Ramachandran), with his stature and calm and composed manner, backed by data, makes them see things in a different light. They listen to him," says Joseph. In fact, Ramachandran also mentors their spouses. That is because, Joseph feels, "even ladies at home have an important role to play in the way their husbands behave and conduct themselves at the workplace". But mentoring is not a one-size-fits-all. Nabankur Gupta, founder CEO of Nobby Strategic Management & Family Business Consultants, cites an example. "Three years ago, I was involved in mentoring the daughter of a large industrialist based in North India. She was distressed due to some personal relationships, which were impacting her and her work. I had to work with her almost as a father figure," he says. "I did personal and professional goal setting for her and helped her bounce back." Most tend to prefer more than one mentor. G.V. Prasad, Co-Chairman and CEO of the Rs 14,820-crore Dr Reddy's Labs, for instance, turns to mentors with experience of managing large organisations. "I seek out people who have had experience in managing growth and innovation and I have certainly benefited from it. For instance, I was not a good listener in the early parts of my career and I worked on my listening skills. I have had experience with several mentors from my board members, from my peer networks and other industrialists. Some have pointed me to other mentors too. I also have paid advisors." Radhika Piramal, Managing Director of the Rs 1,000-crore VIP Industries, too, has plenty of mentors, all of whom have helped her to continue learning and growing. "In addition to my father, who is very competent and my inspiration, all our board members have also been active mentors for me," she says. Piramal has often sought the counsel of people like Nabankur Gupta and Rajeev Gupta, with experience in manufacturing, investment banking and private equity, both members of the VIP board. Reaching out to them and others have helped her think things through better, she asserts. And it is not just the generation next. Kishore Biyani, the founder of Future Group who also leads the Rs 14,000-crore Future Retail, often turns to consultants for guidance. When his two daughters entered the corporate world, he reached out to Ireena Vittal, the acclaimed strategy consultant. Also, both Biyani and his daughters have worked under the tutelage of management guru Ram Charan. "Ram Charan, who has been my mentor and coach, worked on the way I handle meetings and on how you summarise in the end and let other people speak more than you. That was a big learning for me," says Biyani. Puneet Dalmia, Managing Director of the over Rs 3,000-crore Dalmia Cement (Bharat), gives a cricketing analogy to underscore the importance of mentors. Time spent with a mentor is akin to a net practice session before the World Cup for Dalmia, who feels a business gets a big advantage with an external mentor. "He has no emotional attachment to the situation you are in and so can bring in a more objective perspective He can be much more dispassionate." Dalmia has had an outside mentor for about five to six years now. "It has helped me get rid of my own past baggage. Now, I am much more calm, listen more and be more empathetic and understand what a colleague is going through as opposed to just giving my view." Global gurus agree. "Outside mentors have a broad experience in business. They may not know the specific business well but they can listen and give an unbiased and objective advice to the next generation, who would listen to them more precisely because they would seem more objective," says John A. Davis, Faculty Chair of Families in Business at the Harvard Business School (HBS). While he is not mentoring anybody in India, he is "hoping to do more work with Indian families". Swati Piramal, Vice Chairperson of the Rs 5,000-crore Piramal Enterprises, says both her children - son Anand Piramal and daughter Nandini Piramal - have gained from mentoring inputs by industry doyens like Deepak Parekh (on the advisory board of Piramal Realty) and Keki Dadiseth (a board member at Piramal). Nitin Nohria, albeit much earlier to his becoming the dean at HBS, and Professor Bharat Anand, also of HBS, too have mentored the Piramal family children. And it is not as if only big business families are seeking outside mentors. Consider Niyati V. Patel, 37, who last year took up a one-year, part-time programme at S.P. Jain Institute of Management & Research (SPJIMR). She then joined the 130-year-old family business started by her husband Viral R Patel's grandfather, Dinshaw Filteration Systems, an SME. At SPJIMR, she found her mentor in B.K. Vatsaraj, a chartered accountant and a visiting faculty member, and it helped. "Initially, I was very apprehensive and would always look to what others would think and say about what I do. Now, I set my own agenda and make a place for myself." Vatsaraj is currently Deputy Director, Centre for Family Managed Business at SPJIMR. But for every Indian business family seeking an external mentor, there are others who tread a contrarian path. Arun Bharat Ram, Chairman of the over Rs 4,000-crore SRF Ltd, says that different families are finding different answers, with some getting in outside mentors and others managing transitions on their own. He explains the approach his family is adopting. "We learnt how it is done in other families and did get consultants. Everyone in the family also attended courses on how to handle business transition and how to deal with professionals," says Ram, who has mentored his sons. "But ultimately we designed our own structure without outside help." Y.K. Hamied, 78, Chairman of the over Rs 10,000-crore Cipla, one of India's leading pharma companies, has a different take. He recalled his time at Christ's College, Cambridge, which he joined in 1954. He says his father, Cipla founder K.A. Hamied got him to meet Alexander Todd, professor of chemistry at Cambridge University who went on to bag the Nobel Prize and was later knighted. "You first need exposure and then mentoring and this is what Lord Todd gave me until his demise in 1997," says Hamied. Still, there is no denying that external mentors have an important role to play. "Like in a game of golf where one degree shift in the direction of the club can have a hugely amplified impact on the outcome, similarly one strategic shift in thinking can completely transform the cost structure and position vis-Ã -vis competition," sums up Kumar of GMR.